The One Million Bones challenge mobilized students worldwide to make bones as a symbol of solidarity with victims and survivors of ongoing conflict in places like the Democratic Republic of Congo (DRC) and Somalia. Every handmade bone generated $1 from the Bezos Family Foundation for CARE’s work in these regions, up to $500,000! 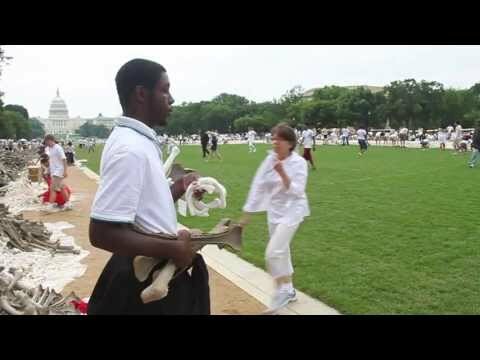 On June, 8, 2013, one million handmade bones – made by students, educators and artists – covered the National Mall in Washington, D.C. as part of a massive art installation and visual petition against humanitarian crises. 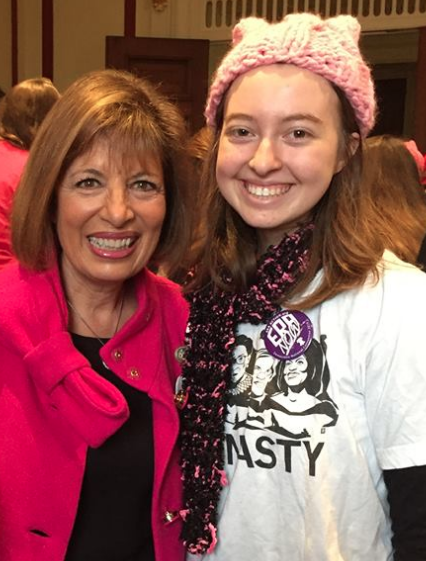 For nearly 2 years thinkpeace girls from California to New York and DC to Germany learned and talked about past and present genocides and other mass crimes against humanity. 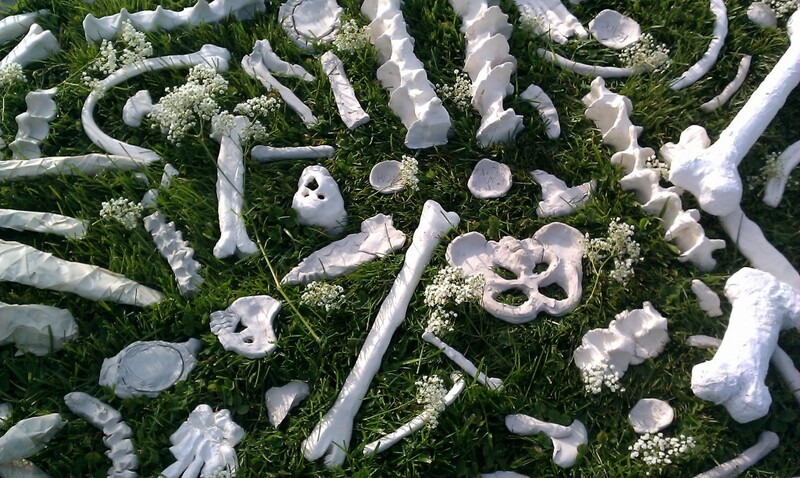 We made bones at club meetings, camps, weekend workshops, and at home, contributing nearly 5000 clay, plaster, and recycled paper bones to the One Million Bones Project. We embraced every chance we had to share this project and cause with others and encourage them to join us. We talked with people in parks, at churches, at the Museum of Tolerance, at schools and online… educating, creating dialogue, and providing space for reflection. We thought we had our heads kind of wrapped around the enormity of the deaths and atrocities as we laid our bones with others in a state installation last April. In reality… that was nothing compared to what lay ahead. 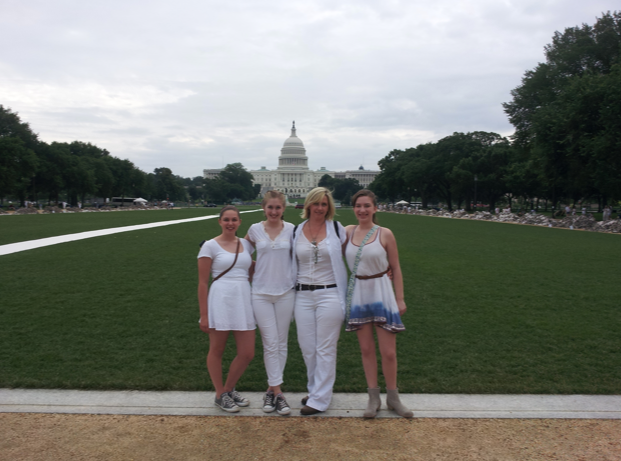 In June a few of us thinkpeace girls packed up our books to study for final exams on the road to Washington, DC, worried about getting swept away in Tropical Storm Andrea, yet determined to be a part of the installation the next day on the National Mall. Eager to represent the thinkpeace community, we donned our white clothes and headed over to the Mall. 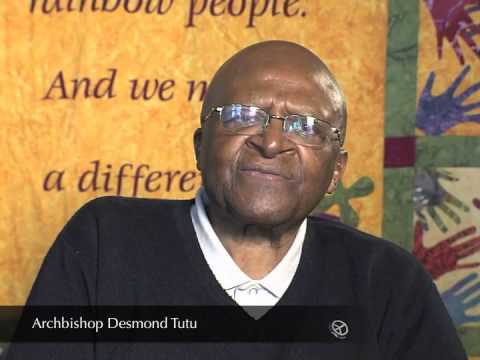 On the way we listened to the message Desmond Tutu sent to the participants. We were so moved by his words: “It is my hope that these bones will transform us to a place of greater understanding and compassion and inspire us to act.” They had certainly done that for us. Together with UPS workers (who volunteered their time for this! ), teachers, artists, religious scholars, children, mothers and more, we laid thousands and thousands of bones that Saturday in June, feeling the weight deeper in our own bones. We had talked often about how underneath our differences (skin color, religious or political beliefs, gender, sexuality, etc.) we are all made up of the same stuff and what is left behind are bones. And they all look pretty much the same. 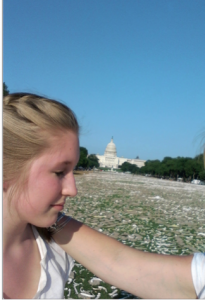 Seeing them in giant piles lining the National Mall was painful. The piles looked like mass graves. There were so many bones. So many. 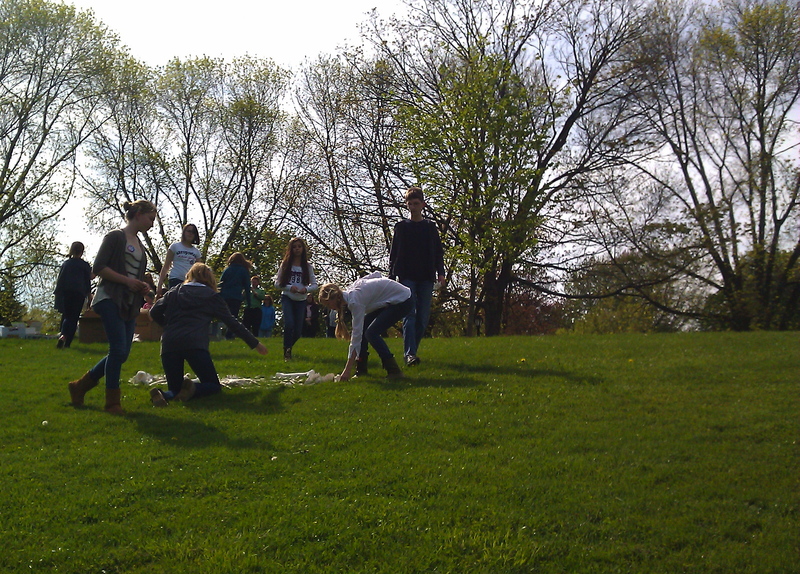 One by one we placed a bone on the grass in front of the United States Capitol. The most beautiful, yet haunting music was being played by Amy Ziff, that sounded like soft cries. It rained, then it was hot and very humid. We weren’t making a dent in the piles. It just seemed endless. And it hit us… the realization that it isn’t ending. That more real bones are being thrown onto piles, encountered along dusty hot roads in far away places, with no real thought as to whose bones they are– is it a child’s? A mother’s? A son’s? A grandfather’s? A teacher’s? Who is being killed today and left behind to become nothing but bones? Every bone is not only “the evidence of a unique individual journey” but also “the evidence of a collective journey– a story shared of the human experience.” (Tutu) Our human experience should be full of possibility and hope, peace and understanding. Once we are bones it is too late. We must come together now. One million bones is just a number. It’s not anywhere close to the number of actual deaths by genocide in the last 70 years. Estimates range anywhere from 30 to 70 million people who have died in genocides around the world, from World War II to present day. Yes, present day. When we packed up the thinkpeace contribution for the One Million Bones installation (thank you UPS for picking them up and calling when they arrived!) we thought we had a lot of bones. 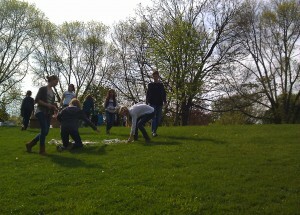 When we started laying them on the National Mall, we thought, Wow! So many bones! A million! And then… when we took a step back to take it all in we were overwhelmed. Remy couldn’t breathe for a moment… the emotions hit hard. Imagining 30-70 times as many bones just wasn’t something she could wrap her head around. The tears fell softly and the hurt was felt deeply. To have created this symbolic mass grave, understanding that it represents a mere fraction of the victims of hatred and intolerance in this world has left us aching. And wanting to keep doing the work. Using our voices and our hands, our own courage, compassion and wisdom. We stood for a long moment arm in arm, shoulder to shoulder, absorbing the bones on the Mall. We are a global family. Together we stand. We feel it, deeply. On this last day of Genocide Awareness month, we are reflecting. It’s been a busy month for thinkpeace girls as they worked hard to raise awareness and funds with StudentsRebuild and One Million Bones for CARE. 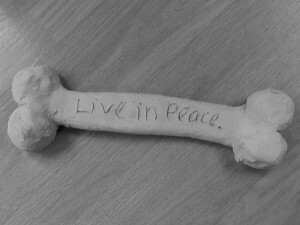 We made bones at our club meetings, at school, at a mother/daughter event, in our neighborhoods and at a community event. With every bone a dollar was raised to go towards the efforts of CARE to help victims and survivors of displacement in the Sudan, Burma, Somalia and the DRC. Through the efforts of thinkpeace girls we’ve contributed about $1000. More importantly, we’ve learned about the ongoing atrocities in these countries and have raised awareness among our families, friends, and in our communities. Most importantly, we have felt the responsibility to bear witness and take a stand for peace. 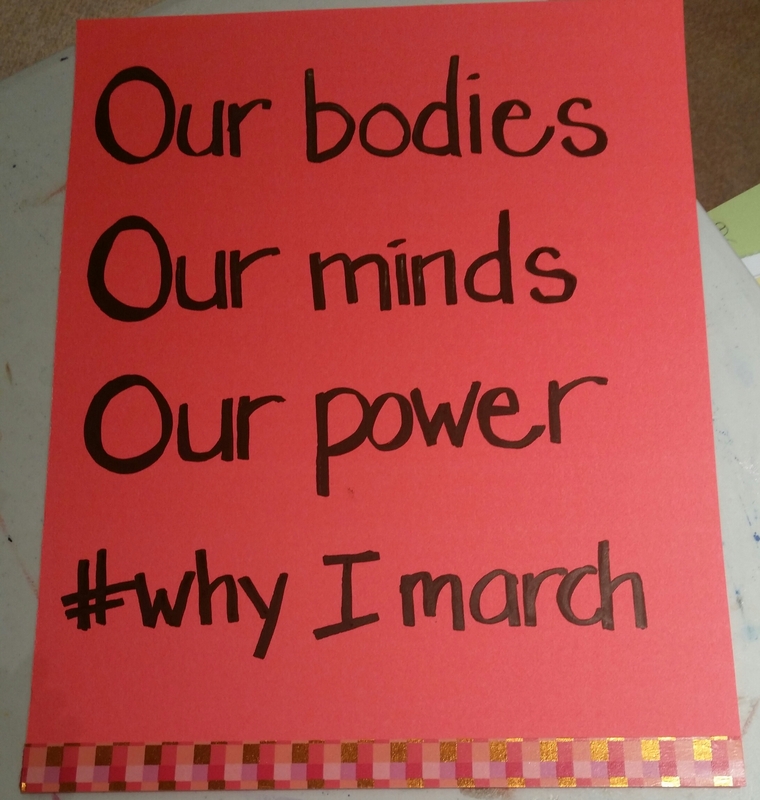 One girl, one voice, one bone… matters. Last week we listened as Holocaust survivor and Nobel Peace prize winner Elie Wiesel introduced President Obama (at the US Holocaust Memorial Museum) with this hard question: “Given the possibilities of power and the suffering of children… what is it about the human psyche that can allow humans to become inhuman?” To which the President responded with “We all love, hope and dream. How can this have happened? We must teach our children that awareness without action changes nothing.” He went on to discuss the need to mobilize peoples’ consciences. 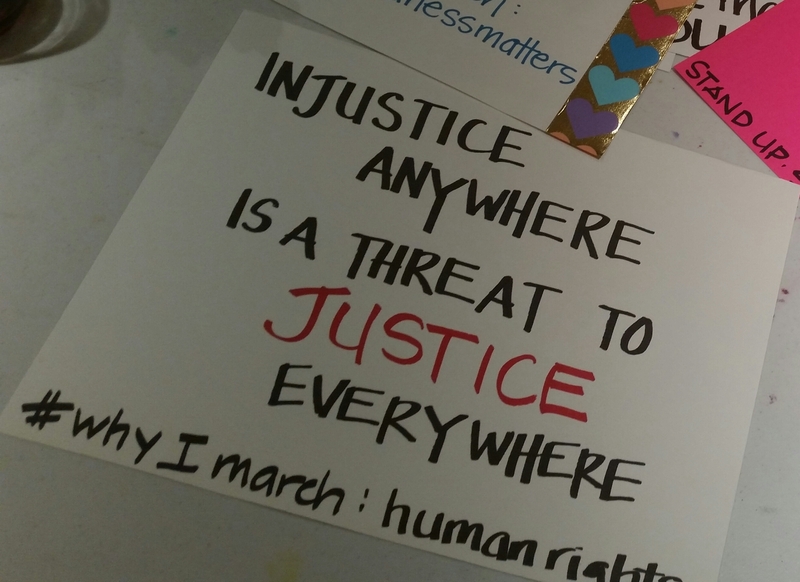 This past month, thinkpeace workshops have focused our efforts on trying to do just that. We’ve talked a lot about how humans become inhuman, enough to murder people they once thought of as friends or worse, who were their brothers, sisters, mothers and fathers. We know that when the flames of fear are fanned, people react. We know that when babies are hungry and there is no hope of a cup of grain in sight, people react. We know that when dynamic leaders make promises of a better future, people react. We are wired to protect ourselves and our children, but at what cost? What is the solution? If we believe in the fundamental right to live in peace then we must not turn our backs to the suffering that continues today around the world. Together we can raise our voices and say, “Never again!” And then, the hard work begins. We have to know what’s happening in the world and connect our voices with those of the people in Sudan, Burma, Somalia, the DRC, Afghanistan, Cambodia and elsewhere who are saying, “Hear us!” Together we can calm fears through education and safety measures within communities. Together we can create sustainable living so that no one is hungry. Together we can learn to listen and share, creating dialogue between all people. What connects us all is our humanity. No matter where we live or how well we live, we are all connected. President Obama said, “Preventing genocide and atrocities are at the core of our National security and are in the moral interest of the United States.” We have to do everything we can to prevent genocide and to help those who have suffered. We must bear witness. Which means that we will take a stand. 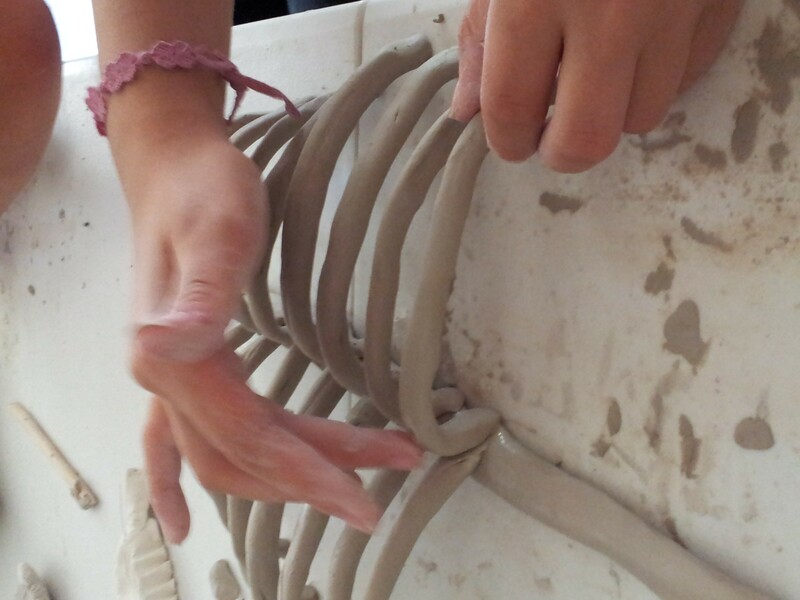 thinkpeace girls have been making bones as a part of a national art statement illustrating the deaths and destruction of genocide. At our state installation in New York, we laced the pathway of bones with sprigs of baby’s breath, signifying a breath of hope– that a new generation will not know this kind of suffering firsthand. Elie Wiesel said, “Memory is our sacred duty.” Let’s hope that generations to come will only know the memories. Let’s work together to ensure that. Let’s bear witness. Let’s use our voices, our hands, our brains, and our hearts to heal the world. I. When I said that I would work for Peace It seemed as if it were The natural place To go to work. I believe in Peace… it’s the right thing to do. There was so much I learned As I started this journey — That although the precepts behind Peace Are so very simple The work of Peace can be quite complicated. 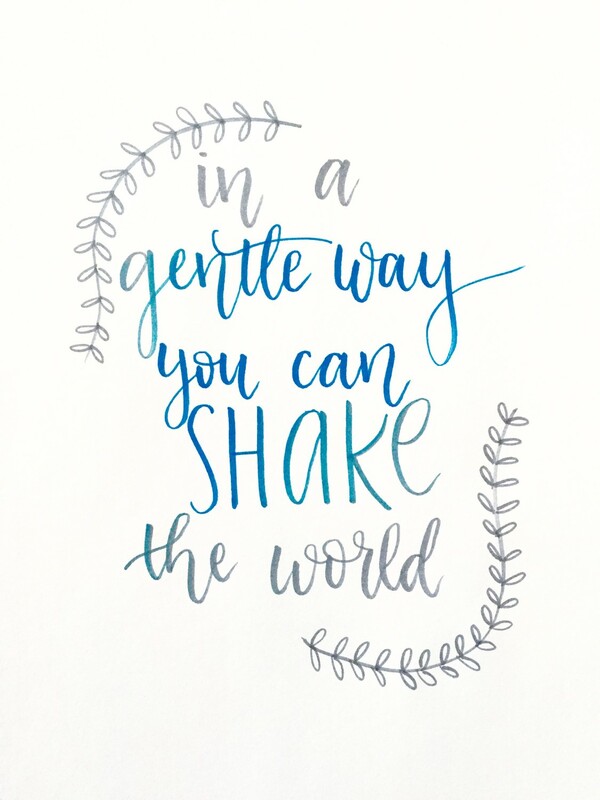 Okay… I may not know How Peace will work everywhere But I can be part of how it starts. It’s not a lot, but it’s a step I can take for Peace. I will accept Peace as my goal And I will bear witness Both when it works And when it doesn’t. II. When I said that I would work for Peace What I didn’t understand Was that all the world didn’t value Each and every girl. I believe in Peace… it’s the right thing to do. It makes me mad when I think That some people don’t think Girls should go to school Or grow up and get a job Or become an astronaut Or a President Or a Peacemaker. It frightens me when I hear That girls Just like me Are being hurt And bought and sold. Why don’t people know How precious they are? Why don’t they care? I will not stand in silence. I will help to make them visible I will learn at least one girl’s name And what is important to her. It’s not a lot, but it’s a step I can take for Peace. III. When I said I would work for Peace I believed that the world Wanted to live without war. I believe in Peace… It’s the right thing to do. And then I read about lives Being destroyed And houses and villages and countries Being leveled Because someone Must win! People are killing one another. They are torturing one another. They are hardening their hearts Against their neighbors. It breaks my heart. It scares me. I don’t know what to do. But I won’t sit around and do nothing. I will speak out. I will put out petitions. I will send supplies as I am able. It’s not a lot, but it’s a step I can take for Peace. I will bear witness… 1. I will bear witness. 2. I will bear witness. IV. When I said that I would work for Peace I didn’t realize that Entire countries were invested In the failure of other countries To live in peace. I believe in Peace… It’s the right thing to do. That war was as much or more About money Than it was about Tribes. That people depended upon Our not knowing that So that they could Continue to pursue their own needs. Well, I’m going to learn about money. I’m going to learn about politics. I’m not going to be Someone you catch in your swirl Of Lies. It’s not a lot, but it’s a step I can take for Peace. V. When I said that I would work for Peace I had no idea how unprepared I was. But now I’m learning what it is I need to know. This much I do know: I believe in Peace… it’s the right thing to do. So I’m setting myself some goals. There is some part of peace about which I will care passionately. I’m going to learn all I can about it. I’m going to learn how I can impact it. I’m going to apply what I learn. I’m going to share what I learn. I’m going to find as many girls as I can Wherever they are in the world Who also care about Peace. There are skills that I have that not everyone has. The world needs my skills, so I’m going to develop them. I’m going to practice them. I’m going to teach them to other people who need them. And then I’m going to put them to work in the service of Peace. And in the meantime, I’ll keep growing up Strong and Lovely Full of art and play and laughter and friendships. I’ll reach out to whoever wants to work for peace. These are the steps, I can take for Peace. And they’re worth a lot to someone! VI: When we said we wanted to work for Peace We didn’t realize how complicated it was. Now that we know, we believe even more strongly Peace is the right thing to do. We’re going to learn. We’re going to make friends. We’re going to help. We’re going to make a difference. We’re going to make a global village Of people who care again. When things don’t work, we’ll try again. When things are hard, we’ll encourage each other. When things are ugly, we won’t look away. When things are wounding, we’ll care for one another. When things are needed, we’ll find a way to help. And when things are beautiful, We will dance and celebrate and share food And Dreams And Wonder And Laughter. Peace… It’s our goal. It’s what we believe in. It’s what we do. It’s how we live.